A very nice example of the scarce Flying Eagle Cent produced for circulation in 1857 and 1858. 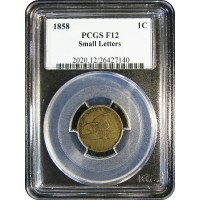 This coin has a light brown patina with nice details and no problems. A great addition to any Flying Eagle and/or Indian Cent Collection. The Flying Eagle cent was a one cent coin struck by the U.S. Mint as a pattern coin in 1856, and then for circulation in 1857 and 1858. The coin was designed by Mint Chief Engraver James B. Longacre, with an eagle in flight. Its, the large cent which was about the size of a half dollar was being issued by the Mint and becoming both unpopular in commerce and expensive to produce. The Mint decided to produce a one cent piece made of an alloy of 88% copper and 12% nickel in a new, smaller version. After the Mint produced patterns with an 1856 date and gave them to legislators and officials, Congress formally authorized the new piece in February 1857. The new cent was issued in exchange for the worn Spanish colonial silver coin that had circulated in the U.S. until then, as well as for its larger predecessor. The mint produced huge numbers of cents, so many were issued that they choked commercial channels. The eagle design did not strike well with the equipment the mint had at the time and was quickly replaced after just two years with a new design.